As the days get longer and the temperatures rise, many visitors to Western North Carolina find themselves drawn to any number of the region’s pristine waterfalls for the visual entertainment and cooling respite that they offer from the day’s heat. But some of these popular spots require a bit more hiking, climbing, and crawling over rocks, boulders, and trails than some folks are willing or able to do. A leisurely drive through the Cullasaja Gorge, with its incredible mountain vistas, might be just the remedy for anyone with a car and a pleasant afternoon to spare. 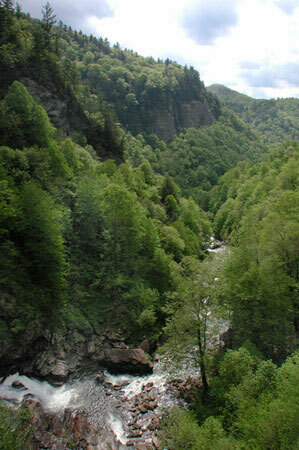 The Cullasaja Gorge, near Highlands, NC, is the first 7.5 miles of a 61-mile, nationally recognized scenic drive called the Mountain Waters Scenic Byway. The gorge is also home to three magnificently picturesque waterfalls, all of which can be experienced from the comfort of a car. The Cullasaja Gorge and all three of these waterfalls are located within the Nantahala National Forest. Bridal Veil Falls, one of the best-known waterfalls in the area, cascades 60 feet from above. It is the most delicate of the three waterfalls mentioned along this route, and its smaller water flow is more obviously affected during times of decreased rainfall. The top of the waterfall slides over a rock face before gently freefalling the last 40 feet. What is so intriguing about this location is that cars can pass behind the waterfall itself! The road, US Hwy 64, has been rerouted for general traffic (because the old road has an ice problem during cold weather), but those who are interested can take the pull-off and go right behind the falls. Bridal Veil Falls is about 2.5 miles west of Highlands on US Hwy 64. There is a parking area just beyond the falls for those who want to take a few photos or spend a bit more time. Dry Falls, less than a mile further down Highway 64 West from Bridal Veil Falls, is nothing short of spectacular. This massive 75-foot masterpiece of nature does require a brief walk, but the path is paved and easy to navigate. The prize that waits for those who choose to do the little bit of walking is well worth the effort – the path goes behind the waterfall. The sound of tons of water roaring overhead and falling below is almost deafening, and the spray that makes its way to the secure path is a great way to cool off on a hot summer day. For those who choose not to walk to the falls, there are a couple of good spots very near the parking-area that have terrific views. There is a $2 parking fee per vehicle. Cullasaja Falls, located almost 9 miles west of Highlands, is a 250-foot work of art that is best seen from the car. While Highway 64 is quite busy – and safe places to park along the narrow road are few and far between – visitors can see this natural beauty in several places along the road. Highlands is a small town (about 1,000 residents in winter, but as many as 20,000 in summer) in Macon County, NC, near the South Carolina border. The scenic little community has a number of restaurants that offer a leisurely dining pace after a pleasant day of taking in the waterfalls. More adventurous visitors to the area can take advantage of the many, many opportunities for hiking, biking, canoeing, kayaking, and climbing that are available all along the Cullasaja River and the surrounding Nantahala National Forest. For more information, please visit www.cs.unca.edu/nfsnc/. Images provided by Preferred Properties of Highlands & UNC-Asheville.